Please contact them by clicking on the image to the left to register and view race stats. 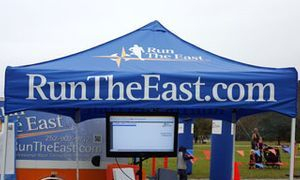 5K certified by USA Track & Field (USATF) as course NC10087PH. The 10K course will consist of running the entire certified 5K course twice. Official Finish Line display clock with bib pull numbers. Mostly residential with slight elevation changes. Traffic will be controlled at all intersections. Water/aid stations will be placed at two locations on the course.